Here, I’ve got a quick task for you. Assuming aces are worth 11, quickly double the value of each card below and add them up. The answer is 50, right? Well, yes but that’s not the point. 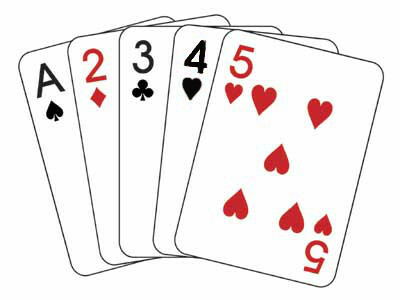 The point is that you probably missed the fact that the 4 of hearts is black. Assuming a passing familiarity with a standard deck of cards, you should know that all heart cards are red. But most people won’t notice because they are busy doing some simple math. Like the black 4 of hearts above, about half of the people who watch this video don’t notice the gorilla who walks through the scene at about the 22 second mark. They’re amazed when they replay the video and see that there’s no trick to it and those who do notice it the first time are equally shocked that anyone could NOT see it. But focusing attention on everything we see is impossible –that’s why it’s called “focusing.” Inattentional blindness happens because we don’t have enough brainpower to pay attention to everything in our view. In fact, in any scene, we can only look at a small part and everything else actually gets fuzzy. To test this, try focusing on the dot at the top of this letter i while reading the words above, below, and around it. Blurry, right? We’re not normally aware of this because our brains fill in (or more to the point ignore) the fuzzy parts. And besides, our eyes are usually in constant motion when taking in a scene, switching between what scientists call “fixations” (brief moments of, well, fixation or focus) and “saccades” (movement between periods of fixation). While pondering how video games might take advantage of this feature in human perception (and it’s a feature, not a bug), two came to mind. 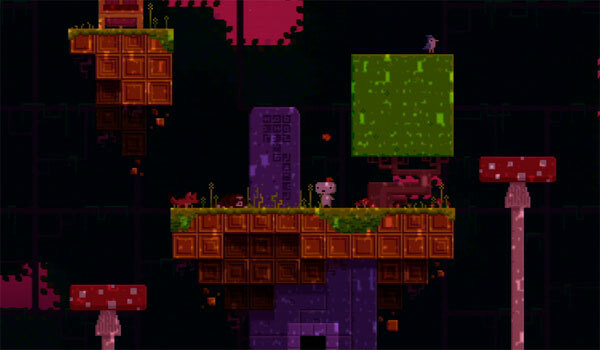 The first is Fez, the unique platformer that uses a brilliant mechanic to rotate your point of view within the game world and make for some very interesting traversal puzzles. Without spoiling anything, I’ll say that there is a lot more to Fez than you see at first glance. Glyphs and symbols are scattered throughout the game, but most players don’t even notice them, at least for a while. And even if they do, many still don’t see the images for what they are or notice the clues needed to decode some of them –this despite the fact that the needed information is hidden in plain sight. But again, focusing our attention on the platforming elements of the game makes us blind to everything else until we happen to notice something odd and pause to reassert our attention. What’s more, you can reach what seems like the end of Fez without ever making any of these critical observation. But if you do, a whole new set of puzzles open up. Another example of turning attention into a resource and using inattentional blindness against the player is a game-in-progress called Papers, Please. It’s still in beta, but you can find “Let’s Play” and quick looks for it all over.4 (Update: The game is now out and available on Steam.) 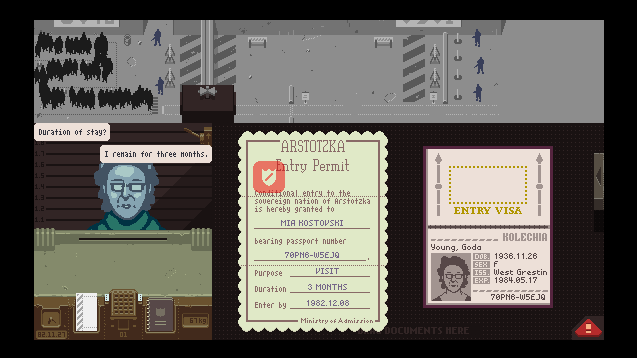 Papers, Please puts you in the unlikely role of an immigration inspector responsible for screening people who want to pass through a checkpoint into a faux Eastern European nation. Most are immigrants, but a few are spies, terrorists, and lunatics. Your job is to review their papers (please) and make sure that they are all in order –that the names match, that the bearer isn’t from a certain city that’s been highlighted as a terrorist threat, that nothing is missing, and more. That means you have to constantly scan the documents and focus your attention skillfully without missing anything important. What’s worse, the rules change and get more complicated with every passing day and you have to do it under time pressure without letting any miscreants through. Papers, Please is inattentional blindness elevated to a game mechanic. Focus solely on city of origin and you may miss that the work permit is not signed. Start focusing on work permits and you may miss that the names on two documents are spelled differently. And then the gorilla will waltz right through your checkpoint and it’s game over. Ah, yep, Spy Party is another good example! Papers, Please is a great example. When there are some many rules to follow and including that my salary is tied to the number of immigrants I processed in a time limit, more mistakes are made, especially when someone in the family is sick.